Sony has been making its own cases and protective covers for the Xperia line for quite some time now. So it's not surprising to see that the company is introducing a series of Style Cover Window cases specifically made for its brand new Xperia Z5 handsets (announced last week at IFA 2015). The Xperia Z5, Xperia Z5 Compact, and Xperia Z5 Premium get a new Style Cover Window case each: SCR42, SCR44, and SCR46, respectively. The new cases come in various color versions, and seem to be similar to the Style Cover Window cases made for the Xperia Z3 and Z3+. They rely on NFC to connect to handsets, and are both water and scratch resistant. 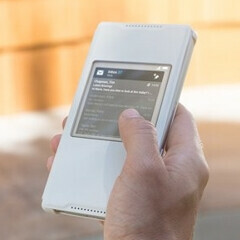 The cases have a "smart window" that allows users to see up to 5 favorite apps or widgets. We assume that all three cases will be launched at the same time with the new Xperia handsets (the Z5 and Z5 Compact should be released in October, while the Z5 Premium is expected to hit shelves in November). Prices for the SCR42, SCR44, and SCR46 cases haven't been revealed, though we guess that they'll cost about as much as a similar case for the Z3 line: around $50. this is actually pretty dope. Japanese now start copying Korean Lol. They have it quite some time.... and yup everybody copied the view cover. Which is a good thing, because it's excellent. Same here. I'm looking forward having Devilcase make them for the z5 series. Their z3 bumper cases are awesome. where is sony's SmartWatch 4? This cover looks more functional then the Note 5 S-View. It actually lost some functionality over the Note 3/4 covers. I wonder if it's due to the sealed back cover which the others had access to. I remember how awful was the Z3 Compact case.